In the real world, not all data is tidily organised. This page shows how to cope with this! The table of forecasts generated by this script. 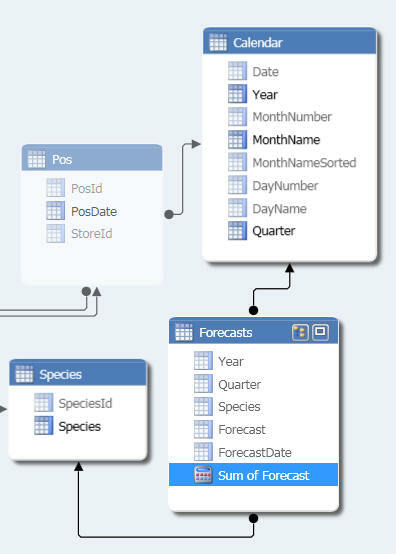 The same table imported into your tabular model. 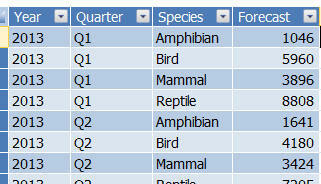 This page will show how to compare actual and forecast data (here we're just showing the Amphibian and Bird species). This calculated column returns the first date for each quarter. The formula calculates the first date for each quarter. It doesn't matter which date you construct, as long as the quarter it belongs to is correct. The measure sums forecasts, but if we display data by quarter and species each cell will actually only "sum" a single value. 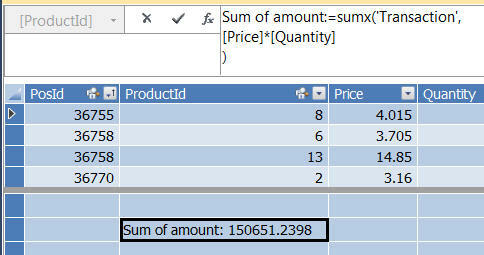 This measure shows total sales (price multiplied by quantity). For each forecast we can pick up on the species it applies to and for which calendar date it was made. You can summarise the forecast and actual sales by year and quarter. Note that if you delved any further into the calendar (for example if you tried to summarise by month) you'd get strange results, because the forecast data was only available at quarter level. 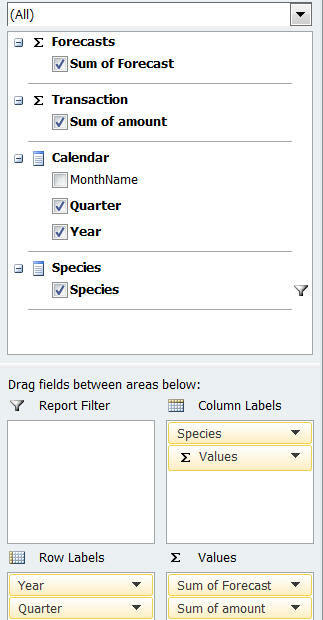 It's up to you not to ask for silly pivot tables! The pivot table, comparing the quarterly forecast with the sum of actual sales for each quarter. You may be worrying that attempting to show forecast data at monthly or daily level will give meaningless or even misleading data, but there's an easy way to avoid this happening; just take care not to expose the forecast figures and months/dates in the same model perspective.